So for some reason, yesterday I felt like making a Christmas card. I'm thinking it might have had something to do with the launch of Muse: ChristmasVisions (if you didn't see the news, check it out!). Thank you so much for such a warm reception - lots of comments and new followers and I can tell you that the team just can't wait to start inspiring you on May 6! But we'll do some introductions before then - we're bursting with our Christmas 'secret'! Our first DT Member will be announced next Wednesday, April 29 at 9 am. As I visited various sites yesterday, Simon Says Stamp's Wednesday CAS challenge caught my eye. CAS and use Hero Arts - right up my alley. 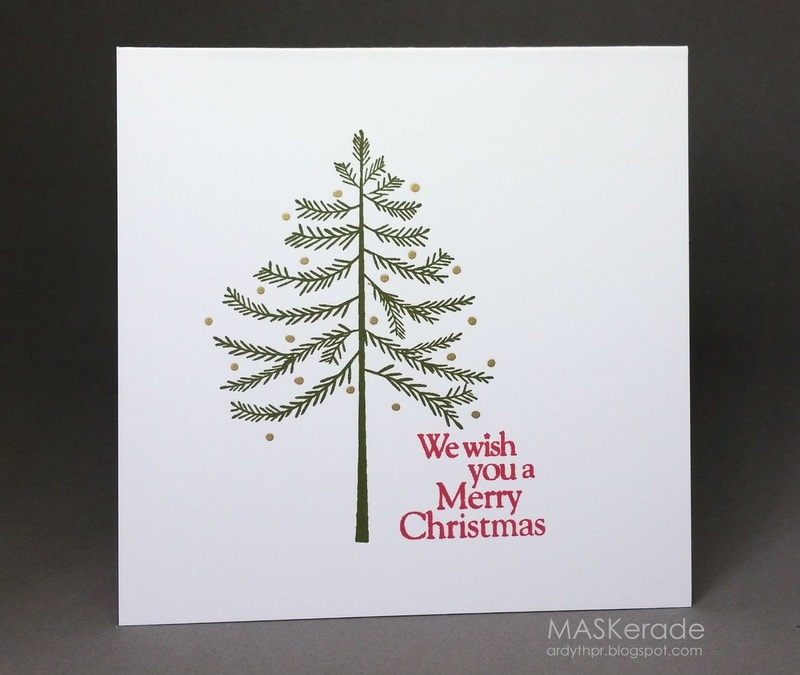 And One Layer Christmas Card Challenge had a new one up as well - anything goes with the option of a tree. I used a Hero Arts tree (SU! Mossy Meadow ink) and Hero Arts sentiment (HA Red Royal). And then I did something I haven't done in a long, long time. I used my Zig Painty pen. Do you remember those? Silver on one end and gold on the other? The perfect tool for adding tiny shimmery gold 'ornaments' to my tree. Beautiful CAS Christmas card Ardyth. OLC perfection. So lovely and perfect, Ardyth! Looking forward to the new MUSE: ChristmasVisions challenge blog! You will turn us all into ZIG-a-rettes with this one, Ardyth! I've never heard of this pen, but love what you done with it! Can't wait to join in on the first Muse: ChristmasVisions Challenge - OR for everyone to hear who your DTs are!! What a cute little tree! Sweet card Ardyth! Love, love, love this Ardyth! Sweet Christmas card...love that tree! Oh, how I love this tree and the SU MM ink seems a perfect colour. This sentiment is very interesting, I really like how it is indented and not all lined up! Love the gold "ornaments" and that cool stacked sentiment! Ka-pow!!! The wee, shimmery Zig ornaments rocketed this sweet tree over the moon! It really is amazing to see how effective a few gold dots can be! Elegant simplicity, lovely Christmas card Ardyth. Thanks for sharing at OLCCC. Love your card Ardyth and I'm pretty happy... I own this tree! lol Congrats on the win too!